Welcome to my first review of the new year! I have a back log of things to talk about (Fan Expo swag, minimates, my ever growing Pop! problem) but I've decided to take a look at one of my favourite Christmas gifts. He's cocky, handsome, and has the bad habit of throwing children out windows. 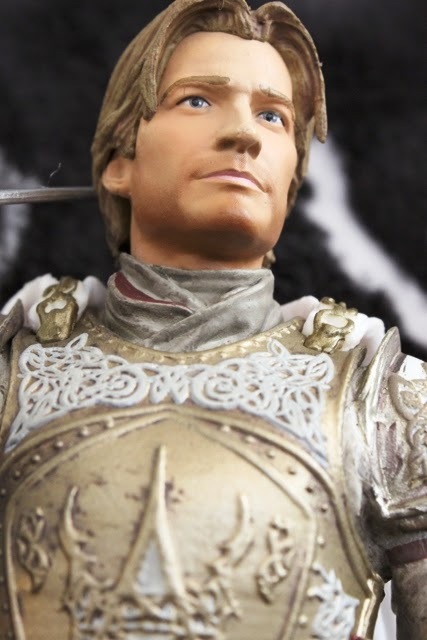 Today I'm reviewing Jaime Lannister by Dark Horse. 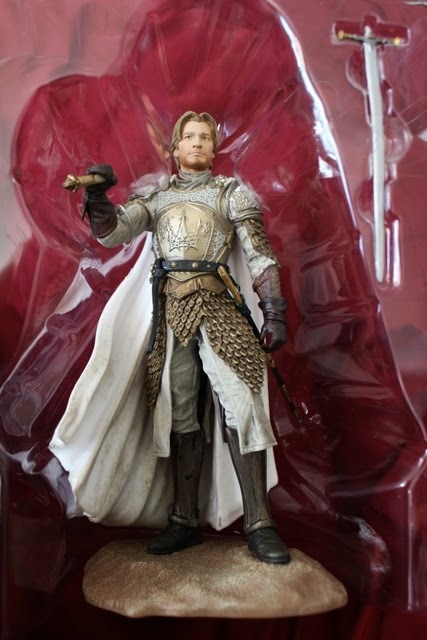 I've had a hard time deciding which Game of Thrones action figures need to be part of my collection. Funko and Dark Horse have both released basically the same set of characters in their respective lines and there are pros and cons to both. The Funko figures are smaller with many points of articulation (great for posing) but the some of the facial sculpts are a little off. The Dark Horse figures are exceptionally detailed but there's zero articulation. They're more like statues, really. A sale ended up making my choice for me, and I picked up the Series 1 Dark Horse Daenerys for $15. Since I don't really need both (yet) I guess Dark Horse it is. The best friends to have are the ones you can count on to enable your collecting habit. Christina Articulates, her husband, and I went on a Christmas toy excursion and I came home with this fantastic figure. The box art is simple black with a picture of the figure and a promotional photo from the show itself. Looks good so far. 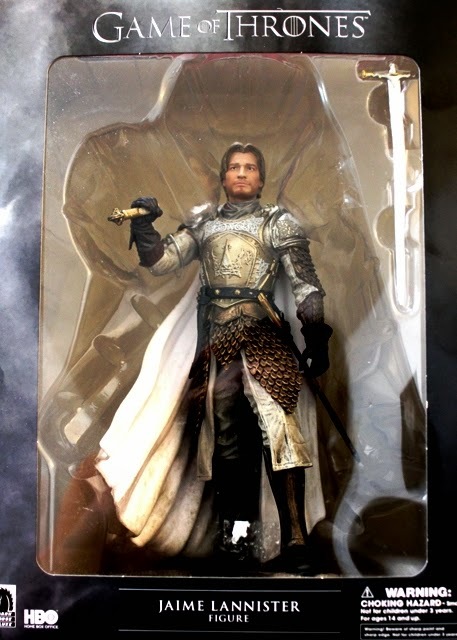 It was quite easy to remove Jaime from his packaging. As you can see, his sword comes in 2 parts. 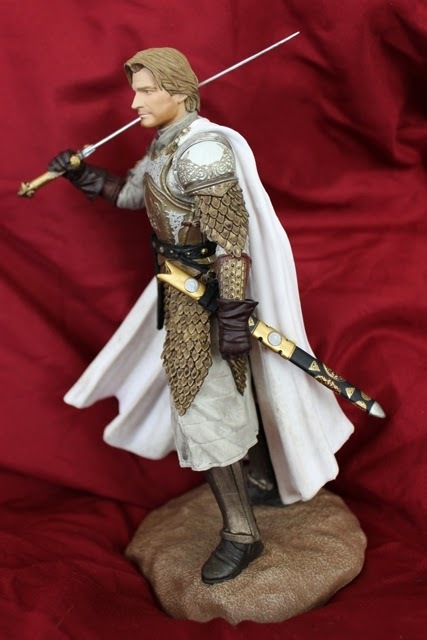 The blade attaches to the hilt sculpted into his right hand. Make sure it locks into place. It's fairly secure once it's in. It's a little strange that the entire sword can't be removed. The base sturdy and matches the other figures. The figure itself is gorgeous. 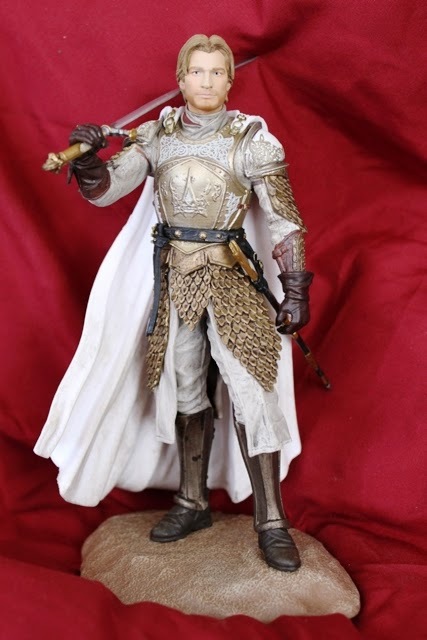 The figure is based on Season 1 of the television show. 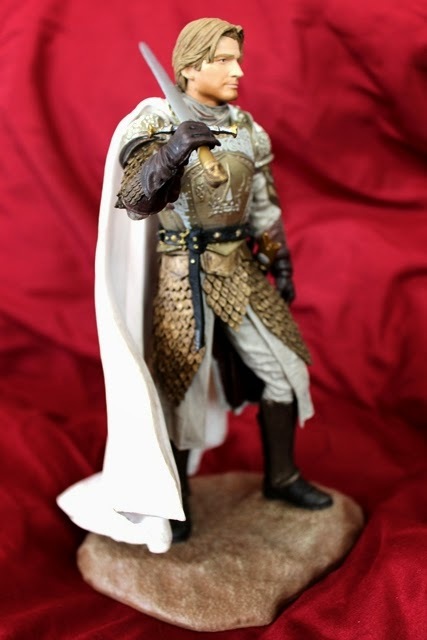 He's wearing the King's Guard armour and white cloak over a beige jacket and white pants. His boots are covered by shin guards and an ornate belt and scabbard finish off the look. The detail is magnificent from every angle. It's hard to know where to start. 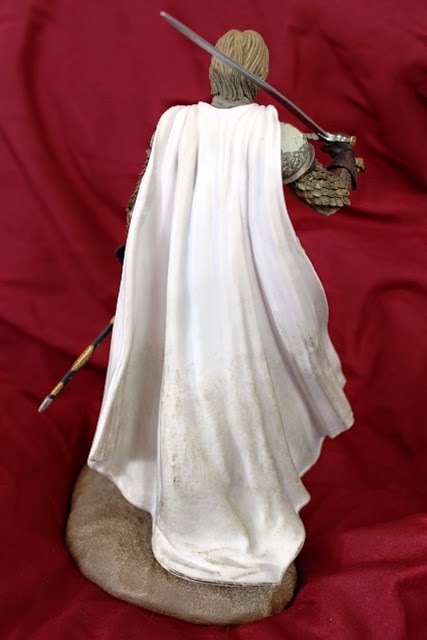 The white cloak is marked with dirt which gets more pronounced closer to the ground. The moulding looks like draped fabric blowing in the wind. His armour is almost screen accurate and the paint is so precise it's scary. Here are a few close ups. 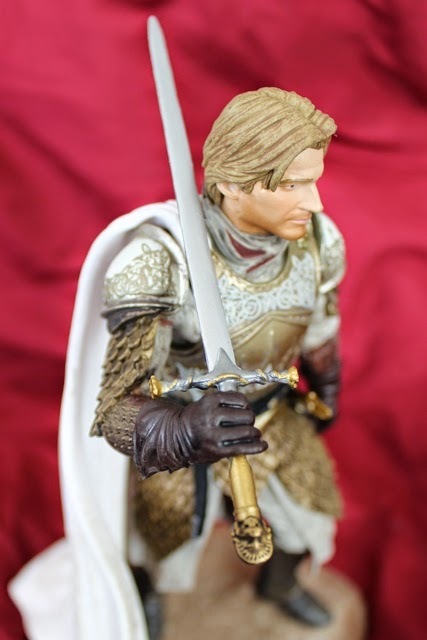 You can see the individually sculpted plates on both the upper and lower arms. 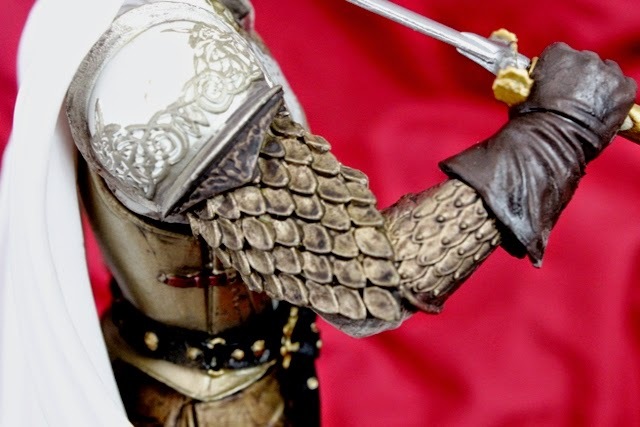 The gloves are painted like leather and the shoulders have an ornate silver detailing to match the breast-plate. Each latch, hook, and rivet is painted separately for a realistic feel. 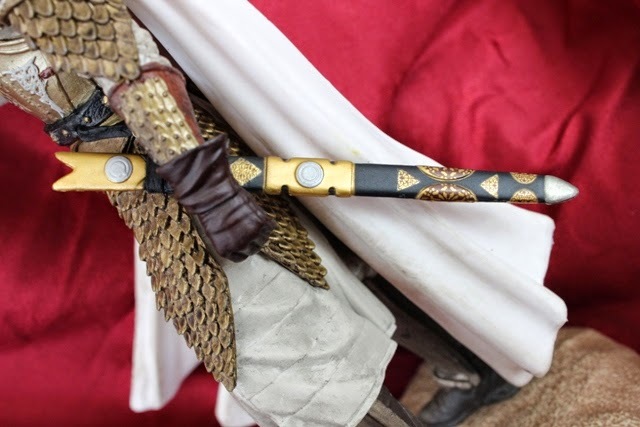 The scabbard has more detail than most of the figures I own. The patterns are phenomenal. What really makes this figure stand out is the layering. Each piece of clothing has its own design. Belts overlap, fabric drapes, and everything is painted separately. 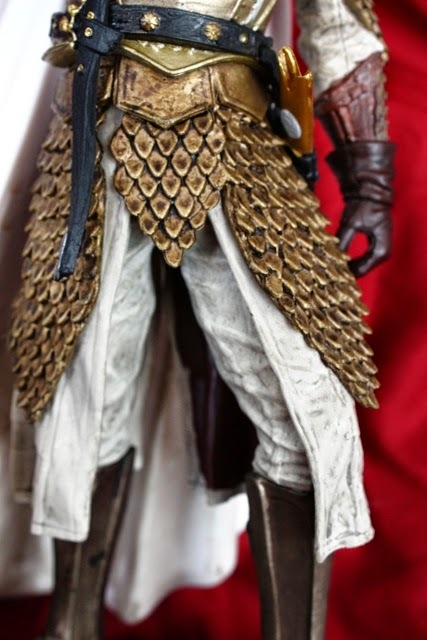 Even the underside of Jaime's tunic is painted. 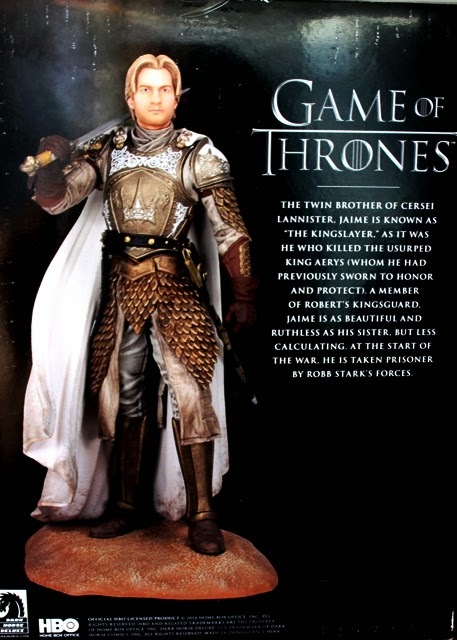 The hilt and pommel of his sword each have designs of their own that represent the lion of house Lannister. Every time I look at him I see something else. Take a few moments to study these photographs. You won't be disappointed. 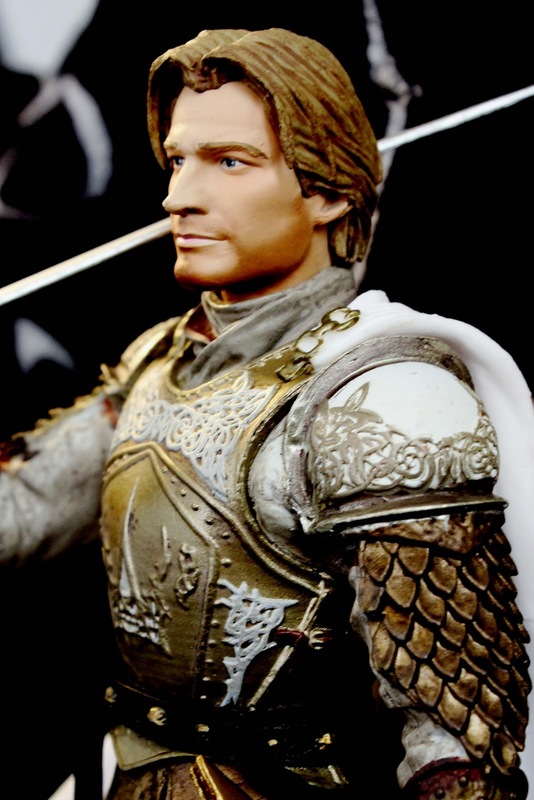 They've been able to capture Nikolaj Coster-Waldau's likeness pretty well. The nose, eyes, and hair create a recognizable image. There's a slight difference in the jaw, lips, and facial hair. 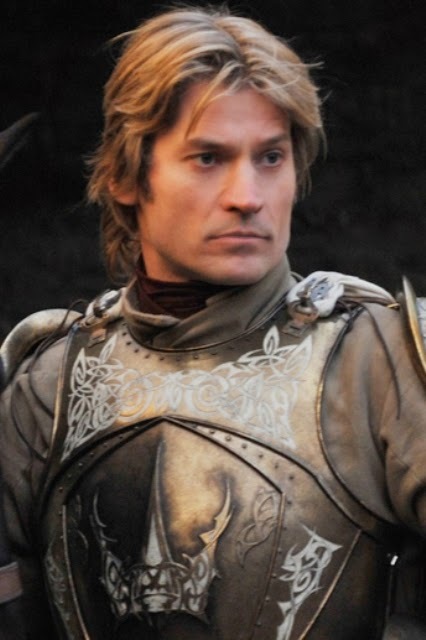 I'd have liked Jaime to be a bit more clean shaven (at least this version) but all in all it's a great representation of the character. He definitely surpassed my expectations and makes me want the entire series. What is your favourite detail? Who should I get next? Tell me in the comments.